Do you Believe? This Christmas show everyone that you and your furry friend certainly do. This absolutely adorable Christmas pet sweater comes crested with stunning rhinestones to spell out the word believe topped off with a Santa Hat. We can already envision this cute Christmas pet sweater on your furry friend. Without doubt you can as well. 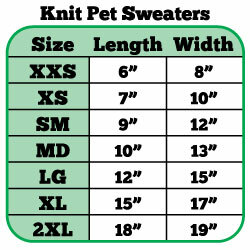 So don't let these beautiful pet sweaters slip away. Get one while supplies last. Purchase a Mirage Believe Rhinestone Knit pet sweater now!